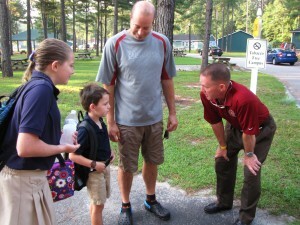 Headmaster Mark T. Cramer welcomes students and parents as they arrive for the start of the new school year at Charter Day School in Leland, NC. As students arrived for the much anticipated first day of classes at Charter Day School in Leland and Columbus Charter School in Whiteville, a few changes on campus greeted them: a record number of students, continuation of major new curriculum enhancements, and a new Headmaster at Charter Day School. Monday, July 23 marked the beginning on the new academic year, and Charter Day School topped previous attendance records with 922 students on that first day. Its sister school, Columbus Charter School also opened with an attendance record of 722 students. “The reason for the excitement and enthusiasm of our teaching staff are several-fold,” said Superintendent Mark T. Cramer. “Last year was a challenge as we instituted major new curriculum changes in grammar, writing, and literacy,” Cramer explained. While both schools usually scored exceptionally well on all of the year-end state tests, Cramer said the Charter Day School Board of Trustees felt these subjects needed to have even more rigor. CDS Teacher Brianna Cox starts the new year working with kindergarten students on the new grammar curriculum. “The new grammar curriculum is incredible with my children learning the parts of speech and correct sentence structure,” said Kindergarten teacher Brianna Cox. She added that they can then begin writing with an understanding of the basic elements of style and correct grammar which are not traditionally taught that early. The literacy elements also underwent a major revision last year with more advanced textual structure and instruction in reading comprehension strategies. “Now that we have a year’s experience under our belts with these new programs, everyone is looking forward to a fun year of the children advancing their skills and showing what they are really capable of,” said Cary Andrews, Associate Superintendent for Reading and Literacy. Superintendent Mark T. Cramer is returning to his role as headmaster as former Headmaster Jennifer Beamer moves back to her home state of Maryland. Mr. Cramer, a retired Marine Corp Major, was Charter Day School’s Headmaster from the school’s founding until 2008. Charter Day School and Columbus Charter School which are managed by The Roger Bacon Academy (RBA) are year-round schools where classes start earlier in the summer but have longer breaks throughout the year. Experience has shown that academic skill retention is higher with shorter summer breaks and a year-round schedule. 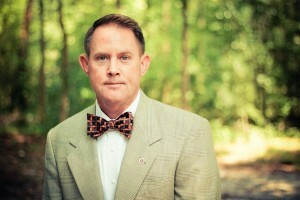 Superintendent Mark T. Cramer reprises his role as headmaster at Charter Day School in Leland, NC. The Charter Day School Board of Trustees was recently recommended by the N.C. Charter School Advisory Council to be approved by the State Board of Education on their next charter school, Douglass Academy. “Now that the charter school cap is lifted, we are continuing to expand and add new schools,” said Barbra Jones, Coordinator of Community Relations and New School Development. “We are anticipating opening our downtown charter school for the 2013 school year and providing quality education to even more North Carolina students,” said Superintendent Cramer. The Roger Bacon Academy schools are tuition-free, open enrollment public schools in southeastern North Carolina. Since 2000, RBA has focused on quality K-8 education and develops premier performance-driven year round schools. Widely recognized as a compelling choice to conventional public education, the organization has built a reputation for dedicated and highly qualified teachers that give students a strong and proven academic foundation. RBA schools have received numerous awards, including the designation of being a Top-25 School for Academic Growth and Excellence in the state of North Carolina.